Today i am sharing informatiom about AP Bangaru Talli scheme, and how to apply Bangarutalli scheme in Andhra pradesh. Bangarutalli scheme is the welfare scheme for girls lunched by Government of Andhra Pradesh on on 1 May 2013 .The scheme supports the family of a girl from her birth till her graduation, Bangarutalli is meant to take care of the girl child in every household. How to apply AP Bangaru Talli Scheme ? Bangarutalli Scheme is meant to take care of the girl child in every household from her birth till she completes her graduation. If she gives birth to a baby girl, Rs 2,500 will be deposited into her account. Rs 1000 will be given for the first 2 years at the time of immunization.Rs 1,500 will be given every year to the family through Anganwadis till the baby attains the age of 5 years from 3rd year onwards. At the time of admission to school, Rs 2,000 will be given every year for her studies from the first to the fifth standard, and Rs 2,500 from sixth to eighth standard, Rs 3,000 for ninth and tenth standard. For the girls study of Intermediate, she will be given Rs 3,500 each year, and Rs 4,000 a year during her graduation. Who is eligible for Bangarutalli Scheme ? People who residence in Andhra Pradesh, All the Below Poverty Line white Ration card holders like WAP/RAP/TAP/YAP/AAP are eligible for the scheme. 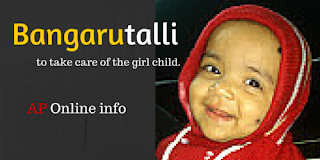 The Girl child born within “two live births norm” born on or after 1st May 2013. Institutional delivery in Public or Private hospital (home deliveries are considered in ITDA areas in, only registration is permitted in other areas and the first milestone incentive will not be paid). What Documents require for obtain Babgarutalli Pathakam ? Is there any time limit for registration under Bangaru Talli? Yes. The time limit for registration is 21 days after the baby is born. 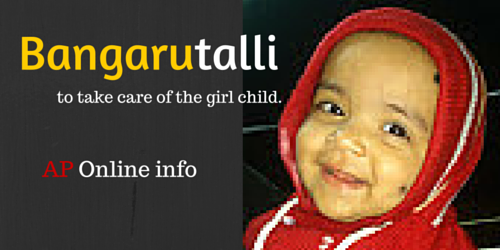 Whom to contact for date of birth certificate of the Girl Child? The certificate issued by the medical officer is accepted. b. If the baby is born in her grand mother’s village or in towns or cities or in other than resident village, the birth certificate can be availed from the local births and deaths registration authority, the Panchayat Secretary in rural areas and Municipal Commissioner in urban areas. Whom to contact for registration? a. The Village Organisations at the village or Mandal Samakhya at the mandal level in rural areas. b. The Slum Level Federation or Town Level Federation in Urban areas. How to get ( Download ) Bangarutalli Application Form online ? My baby was born on 15th April 2015.I arranged all required documents but no one accept the application even i tried in Mandal office also they said now scheme is stooped we are wattling for orders from govt. please confirm and guide me.